But you already knew that. The question is when should you book your next flight? Private jets and aircraft are complex machines that take a sizable staff to maintain, schedule, and operate. These roles include scheduling, dispatching, maintenance, crew, catering, ground transportation, etc. There's a number of actions that the charter company performs behind the scenes to make sure that your flight departs and arrives on time. If any of these actions take longer than expected, it can have unfortunate delays on your flight. All of these checklist items take time to complete. We've found that it takes on average, from start to finish, at least 10 hours of human labor to perfectly organize a charter flight. Not to mention the 10 things you need to have ready before booking the flight! So when you should you book your private flight? How about several months in advance? 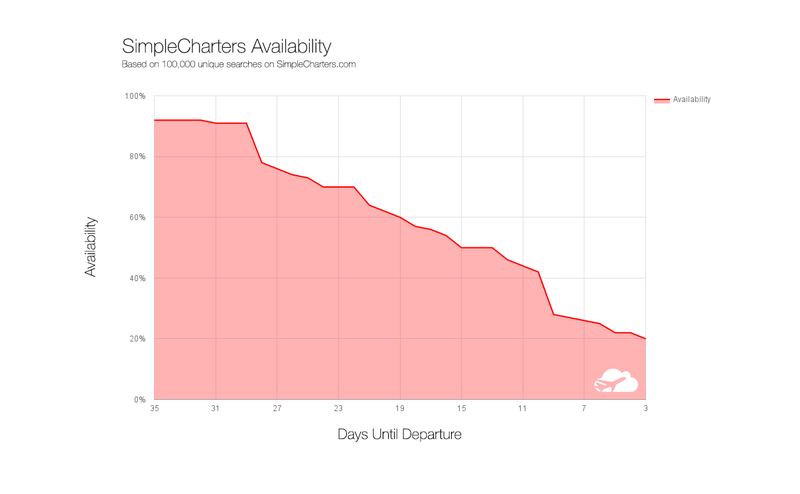 This is usually ill-advised because there is a certain uncertainty in the charter market, as well as your schedule. It's common for aircraft to be repositioned around the country, to go offline for upgrades, bought and sold, or even transferred from one operator to another. You want to make sure that when you book a flight, you're not going to find yourself on a different aircraft than originally planned. The trick is to book your flight before others while keeping your travel schedule in mind. Most business charter clients report that their meetings are confirmed up about 2 weeks in advance. That leaves 14 days to book a flight. We've sifted through the data, aggregating more than 100k searches to uncover when other prospective customers are looking to book their flights-- solely so you can beat them to it. As you can see, there's a clear trend of people beginning to look for their flights seriously close to their departure date. 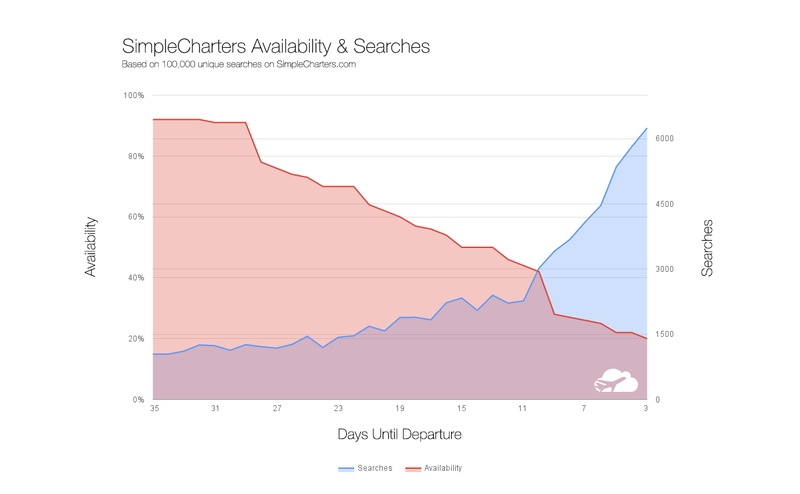 This increase in searches on SimpleCharters also suggests that more and more people cannot source aircraft for their trips elsewhere. It's the intense amount of work that operators and brokers do to offer their clients a single quote, and the decreasing likelihood of closing the deal as T-0 approaches. The ideal time is to book your flight at least 11 days before departure. While it's still possible to book a jet within the 11-day window, your chances of finding the ideal aircraft for the right price will quickly deteriorate. This is why customers typically have to call multiple operators and brokers to source a flight, which eats up precious time. 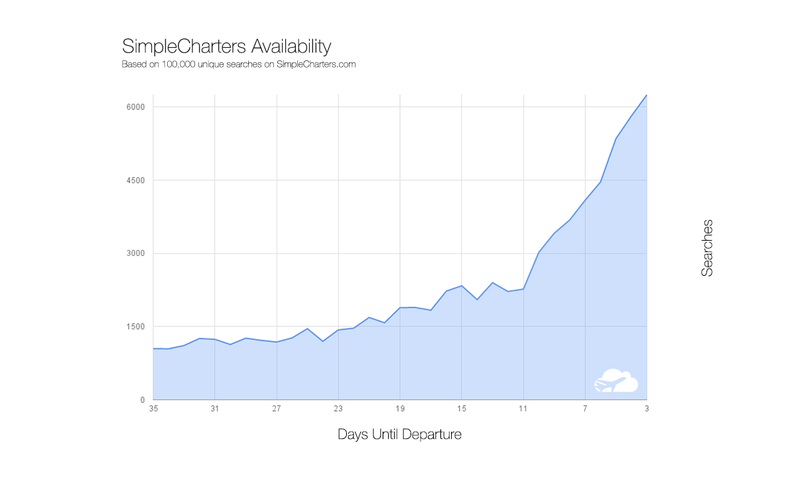 Save yourself the hassles next time and book on SimpleCharters and aim for at least 11 days out! We'd love to hear your experiences about booking private flights, or other things you'd like to see analyzed. Let us know in the comments.